I hope you enjoy it Emma. I do love smoothies and I do love that green tray! it does look remarkably spring like Nayna! but, I know it isnt!!! Yes definitely free from additives and preservatives. Yes sylvia its healthy because of the low fat yoghurt nad honey ,need this after xmas indulgence. This sounds delicious, I love how you've put them in the bottles! The smoothie looks great. I love the bottles and the fact that you rescued them from recycling!! Thanks Mina, yes I am really pleased with the bottles and the wooden stump is the tree trunk I was telling you about. Oooh these sound amazing, perfect as a snack or breakfast! Yes something tasty thats not high in fat. I'm really into trying new recipes for all sorts this year I reckon when it gets a bit warmer I will give these a try. I love smoothies and it is always nice to find a good smoothie that don't have banana in it (allergic) these looks so nice. This looks like an incredibly refreshing drink Nayna. These sound delicious. Smoothies are my go to breakfast at the moment. Perfect for when in a rush. Yes if not the taste but the colour is so pretty. I wish I liked smoothies as these do sound good. I hate the texture of them though :( My son loves them so I might give this a try with him. That sound yummy and the colour fantastic. That sounds nice. Love the little milk bottles. Oh yummy - this would brighten any day up - my kids would also go mad for it! Ooh I love smoothies these look so tasty. 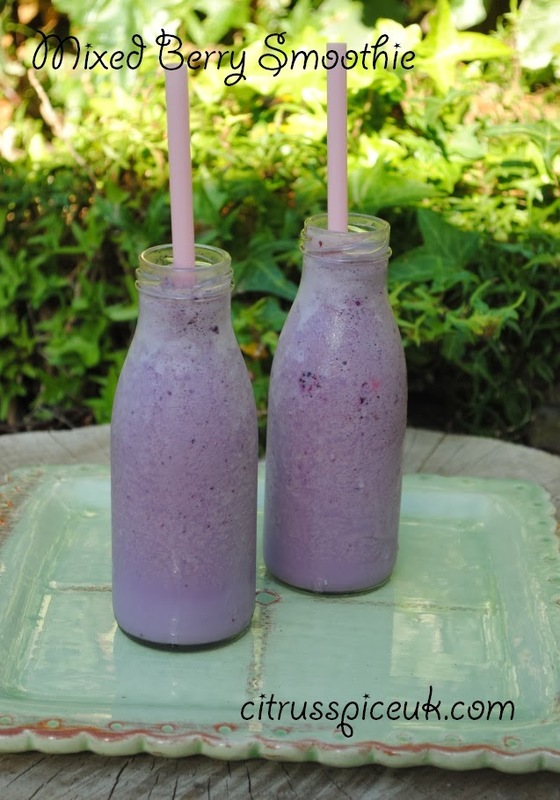 Ooh fabulous I love mixed berry smoothies - look delish! The beautiful colour of the tray makes it look like Summer. What a lovely gift! I love those bottles and the tray. We found a lovely shaped glass bottle in the shed of the new house we've just bought and I got really excited when I saw it....I reckon hubby thought I was a bit crackers! I know the feeling I can't walk past a skip thinking I can take that piece of wood and paint it for food photos.If it wasn't embarrassment of being caught stealing from a skip I would have taken the wood!!! My heart bleeds when I see that aged piece of wood that would be perfect for the photos. Perhaps a bit premature for "Spring" lol, but looks lovely! Your sister was going to chuck those bottles away?!?! Tut! Lovely photo, and the smoothie looks so tasty. My kids would love this. Lovely picture and the smoothie looks really tasty. I think my kids would like making this as well. Looks delicious. I wish there was sun here to enjoy it with. Have pinned this to my Pinterest Food board. Love smoothies they are sooo yummm , the props are lovely Nayna espp that tray - very pretty ! Ooh your tray is gorgeous :) The smoothies sound lovely too. Great props! D (my son) loves smoothies, so I may well be back to give this a go. Visiting this recipe again and still loving it.